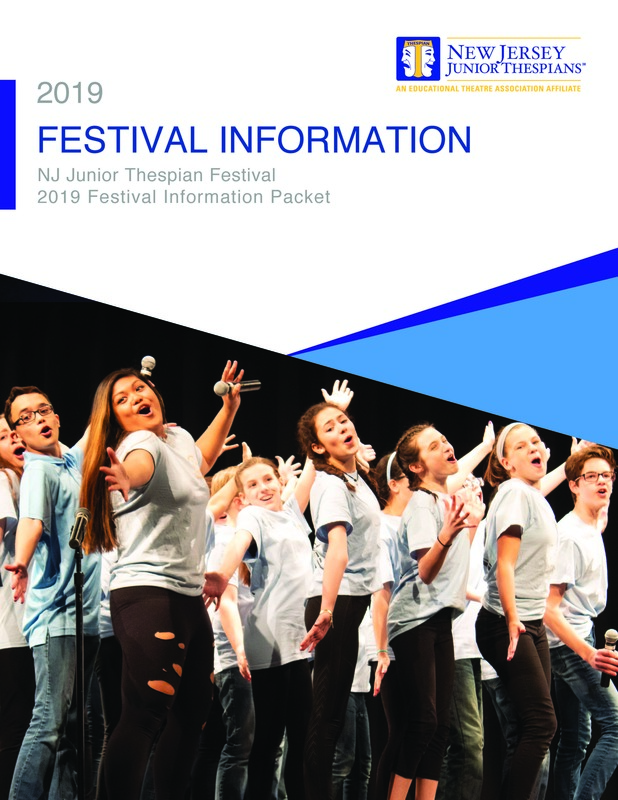 School registration for the 2019 NJ Junior Thespian Festival on May 18, 2019 at Toms River High School North for students/teachers in Grades 6-8. This school registration will take approximately 30 minutes to complete. Please have all your school, student, and event information with you while filling it out. The form does not have the ability to save in between sessions, and will not save your progress if you need to reload the page. It is recommended that you use a computer to complete registration. If you have any questions or technical problems while filling out the form, please email njjrthespians@gmail.com for assistance. Submit all registration materials no later than April 5, 2019. I have read the Festival Info Packet in its entirety and have reviewed the Registration Checklist. Directors/Assistants attending the festival will be able to earn Professional Development Credits. 6 Credit Hours will be earned for Saturday. For insurance purposes, we are required to have the names of ALL adults (adult attendees, student attendees, and chaperones) accompanying the students to the festival. All adults and students will receive a name badge at the registration table. No one will be admitted to any areas of the festival without a name badge. Each student attendee is provided with the ability to attend workshops, participate in a showcase, meet other Thespians, enjoy a provided lunch, and get a festival theme t-shirt. One chaperone is required for every ten students attending the festival. (ex. 35 students requires four chaperones). Chaperones will be required to stay with their assigned student group, and may not be with students from their school. Chaperones do not receive a festival theme t-shirt, but will enjoy a provided attendee lunch with their group. A teacher or parent may be a chaperone, and chaperones attend free of charge. Each adult attendee is provided with the ability to audit workshops,watch Showcases and Individual Events, enjoy a provided lunch, and get a festival theme t-shirt. Adult Attendee fee is $25 each. Adult attendees may be additional production team members, school personnel, or for special circumstances. NJ Junior Thespians is constantly striving to accommodate the needs of all festival participants. The festival is held on the bottom floor of the high school and there are no barriers. The seating in the auditorium is accessible to individuals with mobility concerns as well. If an attendee is visually impaired, hearing impaired, or has any learning or developmental disabilities, it is the responsibility of the school to notify NJ Jr. Thespians if suitable accommodations need to be made. NJ Junior Thespians is unable to fill everyone's requests, but we do make an effort to do so. You are invited to submit pictures of your students. Attach pictures representing your school’s drama club, rehearsals, classroom work, musical, play, or other event. A slideshow will be made with the submitted pictures for Opening Ceremony. Throughout the day, we will be playing music and we would like the title of your current musical and song to add to our playlist. 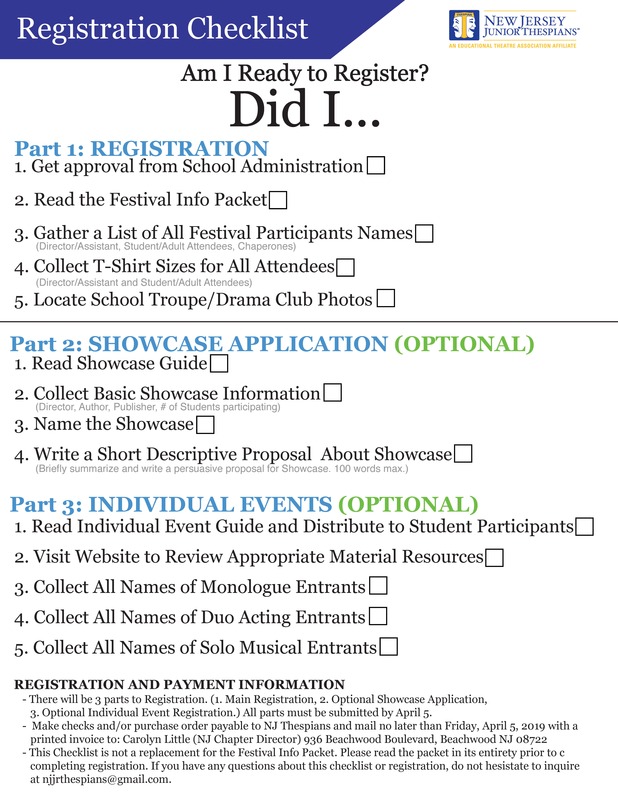 Do you have any questions, comments, or specific needs regarding registration, or the festival? The form automatically collects the data you have entered in the above areas. The following is an invoice for festival registration. After registration has been submitted and reviewed, a PDF of this invoice will be emailed to you. The form automatically calculates based on your total number of festival participants.